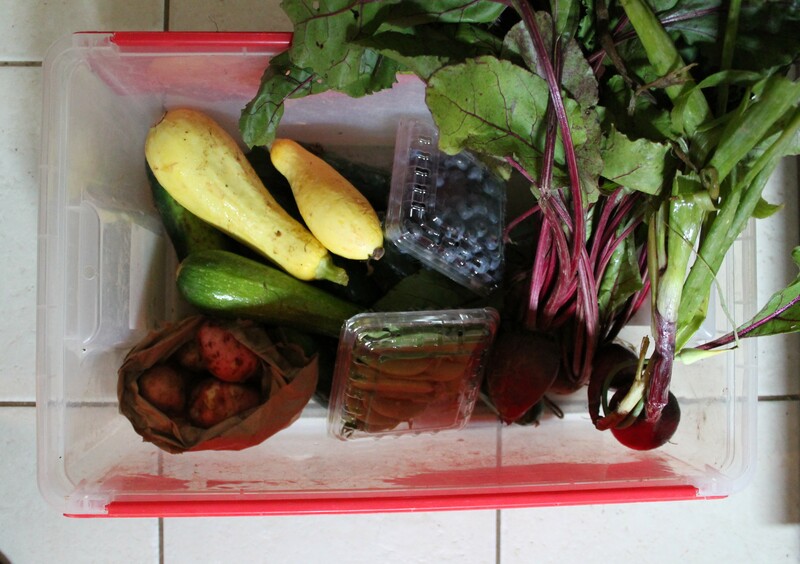 After 20 weeks of fresh, seasonal produce, CSA has come to a close for the year. As I reflected on the experience—what I ate, what I didn’t, what I learned, and what I wished I had known—I thought it might be worthwhile to share my overall impressions of being a CSA member with you. 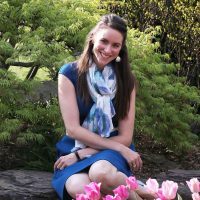 So if you are asking yourself the question, “Should I join a CSA?” then I hope I can help you understand what the experience might be like! Anyway, from the last week of CSA produce ever (er…at least for this year), I am sharing with you the most delicious macaroni and cheese ever. Did you know that mac and cheese is one of my favorite foods? And yet, in two and a half years of blogging, I have never once made it for you. That’s because I am a mac and cheese snob. That’s right. You heard me. I have spent the last two years trying to perfect the absolute best mac and cheese recipe (gouda, asiago, ad pecorino with a dash of truffle oil…yum). But I realized, this is just like the time I thought there was only one perfect chocolate chip cookie recipe. Which is completely silly! Which, of course, means I have been remiss! 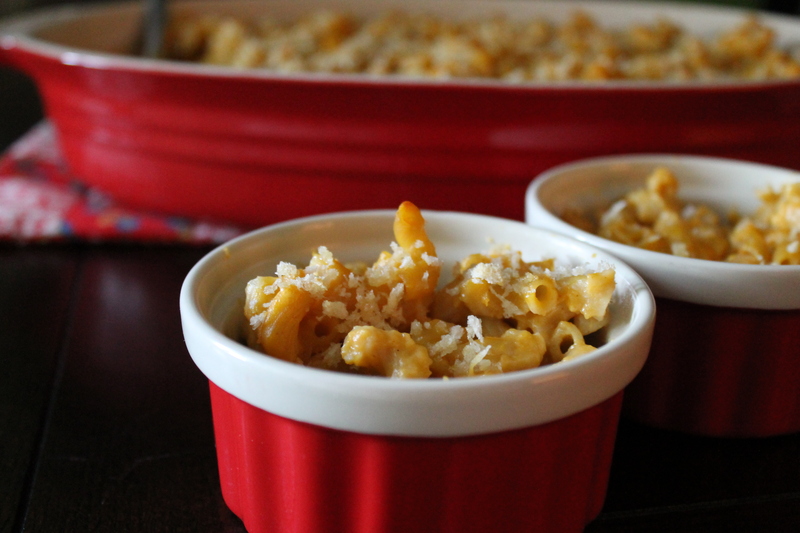 When I found a recipe for butternut squash mac and cheese, which is so trendy and so different from the rich bechamel sauces I had been obsessed with, I was so excited! This mac and cheese is full of flavor. And the weird thing is it doesn’t really taste like squash at all! There is just a tinge of sweetness and warmth from the cayenne and nutmeg. But mostly, the macaroni tastes cheesy and salty from the parmesan and pecorino and just a little nutty from the gruyère. Enjoy the last week of CSA for 2013! 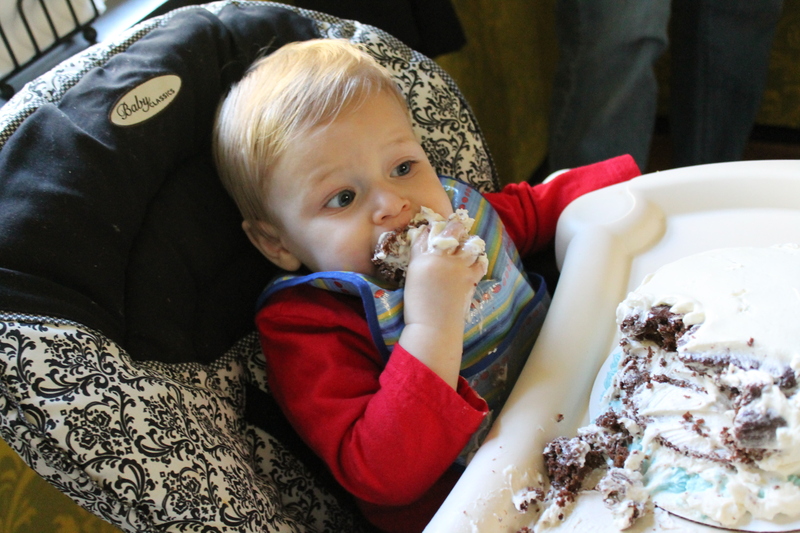 In keeping with my goal to one day turn into Annie of Annie’s Eats, I planned the heck out of a birthday party for him. 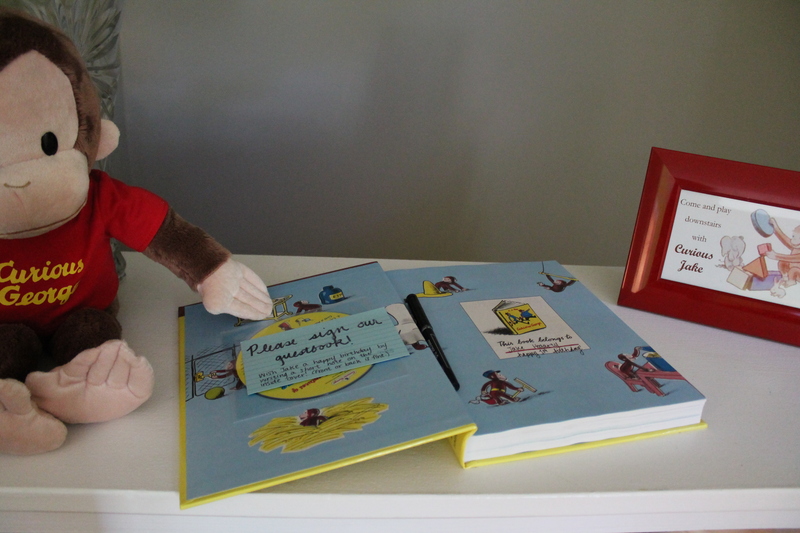 I landed on a Curious George theme (from the books, not the show), because my kid looooves to investigate anything he sees or gets his hands on. And he gets into everything. It seemed fitting. I spent days and days cutting cardstock into circles and stripes and triangles to make favor tags and birthday signs. 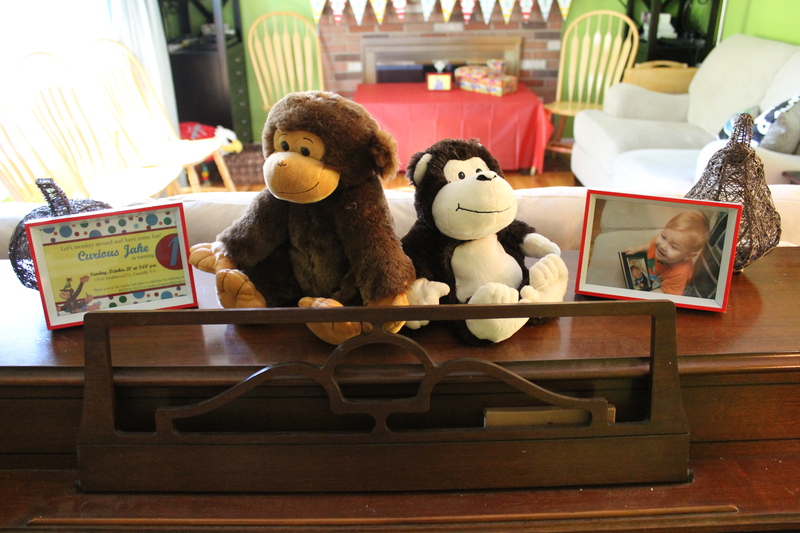 I framed pictures scanned from the Curious George books to accent the whole house (gift table, cake stand, activities for kids, you name it!). 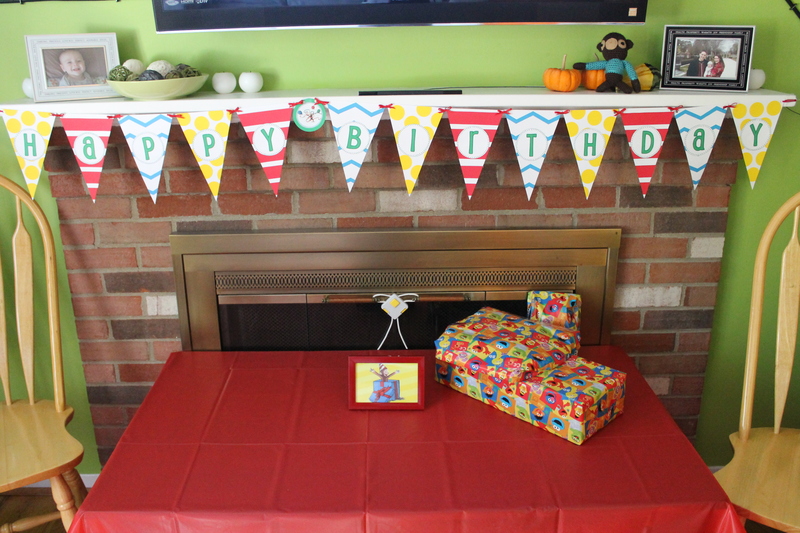 I blew up balloons and tried to redecorate the entire house into primary colors (um, yes, I did tack yellow vinyl tablecloths to the walls. I don’t want to talk about it). It took a lot of effort. I got very little sleep. 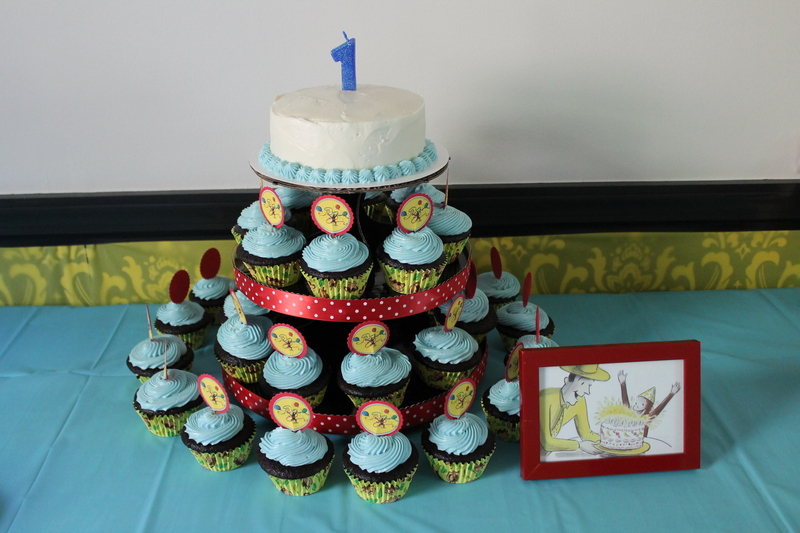 But in the end, I was so happy with how Jake’s party turned out! He seemed to have fun, too. I am so proud of this smash cake! I wanted to make something that wouldn’t overload him with sugar out the gate, since we have been very diligent with his diet up til now: the only sweetness he’s ever had has been from actual fruits, and I’m not talking about juices or concentrates. I decided that I wanted to give Jake chocolate cake because it’s clearly the best, but I also wanted it to be vaguely familiar to him, with minimal added sugar. So I decided to include fruits, which would lend flavor, texture, and sweetness, without being overpowering. Hence, chocolate prune cake! Folks…this recipe and I did not play nicely together. I think I may have lost my mojo or something. For weeks now, almost everything I lay my hands on has turned out a little…off. I have mandolined myself and microplaned myself (ouch)…I have baked and rebaked (is that a word?) countless times. Honestly. I am a disaster. And true to form, my husband generally takes one bite of my awkward dishes and proclaims that he likes them better this way than however they were supposed to turn out. No, he is not just saying that to be nice. He actually does like things better when they are a little wacky. It’s perverse. It makes it hard to evaluate whether something new was actually successful. Take this bread pudding, for example, which I found when I was trolling through Bizzy Bakes for an SRC recipe this month. 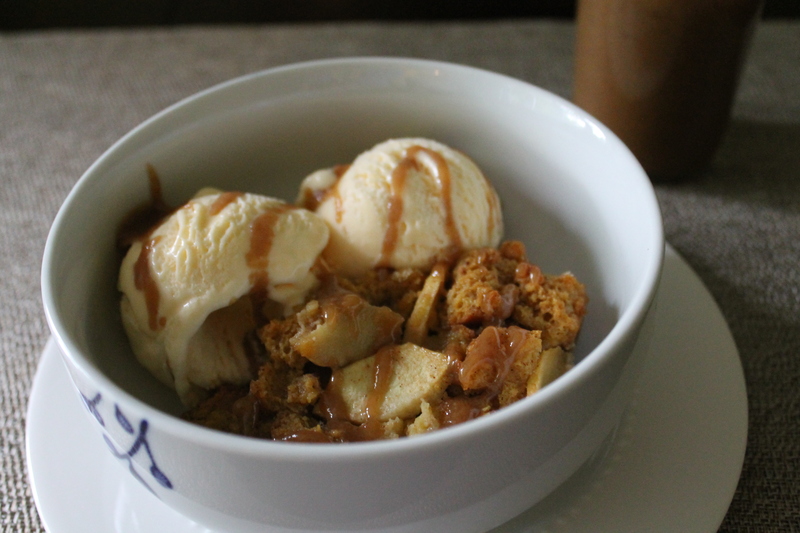 It was so cool to me that Bizzy made a gluten- and dairy-free bread pudding. Way to push boundaries! My mom follows a wheat-free, dairy-free diet, so I especially appreciate finding recipes that would work for her. But…I also like to save my more expensive alternative flours and non-dairy milks for times when she will be around to enjoy dessert with me, so I knew right off the bat that I would be changing things up a little. I thought I would be all cool and snazz the bread pudding up by adding pumpkin and using only egg yolks and baking in a bain marie. Ha. Ha. Ha. By the time my Bible study group showed up, I was still panicking about how the top of my “pudding” was crispy (erm, not enough custard) and the bottom was soupy (sooooo didn’t need a water bath for this). But they literally gobbled it up. I mean…one guy liked it so much, he was batting people away from the dish, trying to keep more for himself. And, of course, Dave said he liked it better than a real bread pudding. One of my college friends has a terrific mom. She is such an excellent hostess—she remembers every conversation we’ve ever had, no matter how long ago; she works hard to make sure everyone who comes to her house has something delicious to eat that suits their dietary restrictions; she has a warm, welcoming spirit; and best of all…she makes amAZING rolls. I have literally eaten meals almost entirely composed of her rolls. A few years ago, she was gracious enough to share the recipe with me. 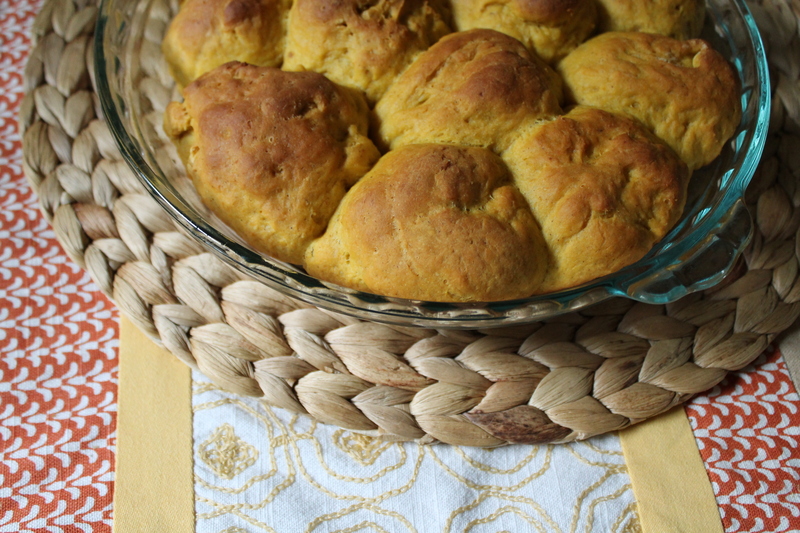 This pumpkin version has become a staple at my house, and I know you will love them, too! Happy pumpkin season! 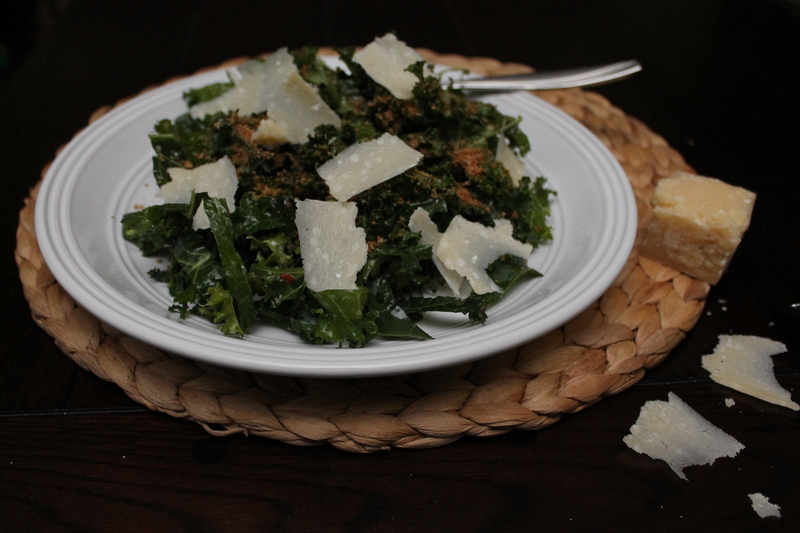 I bought some kale a few weeks ago at the farmer’s market so I could make a kale salad. I was so excited! Sarah came over and she got excited, too! But the recipe I had was a little weirdly written…and to make a long story short, there was too much dressing. Tooooooo much. Slimy kale salad. Gross. But I got kale two weeks in a row from CSA! So I tried again! You may be scared of raw kale. But I promise, this salad is delicious! Just try it. I know you’ll be glad you did! I have a lot of squash in my house. 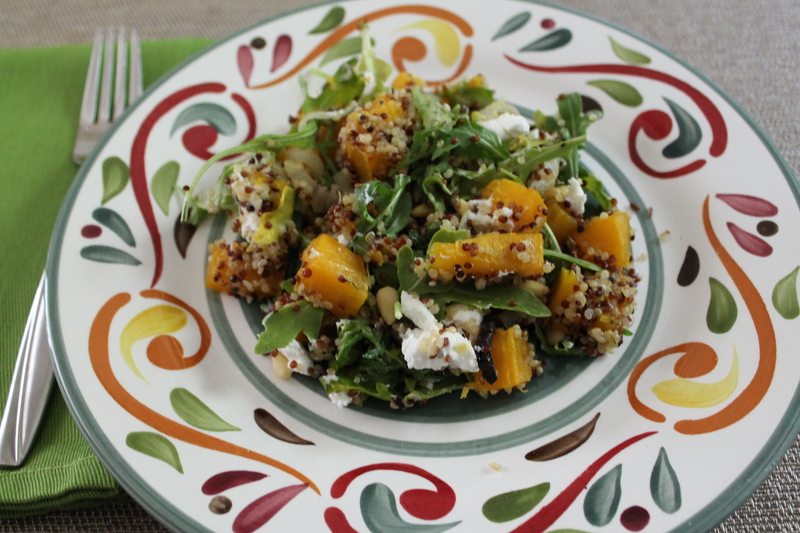 And one of the easiest ever ways to use up fall squash is to roast it and toss it into a grain salad with some greens and cheese. I have been a little reluctant to share this with you, because I feel like this particular combination isn’t terribly original. Quinoa salad. Been there, done that. But you know what? Sometimes the familiar is just what we need. 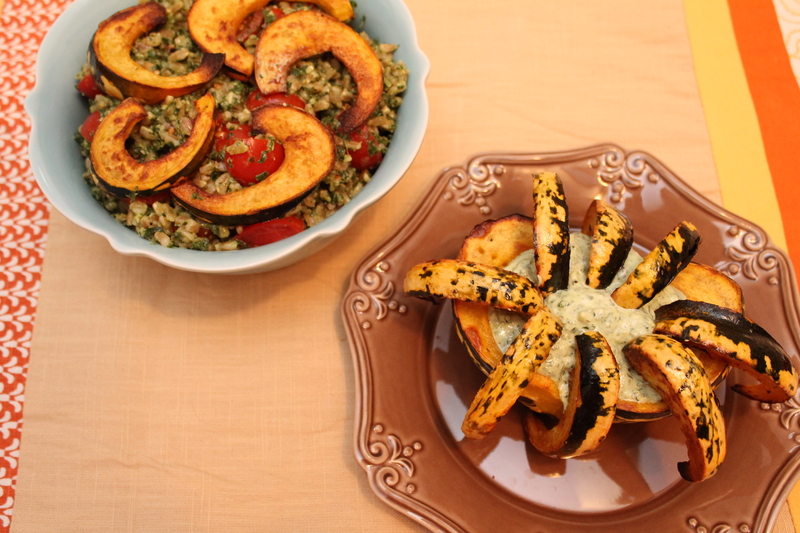 Sometimes simple food with bright colors and flavors is comforting. Sarah of Well Dined came over and made this lunch with me. We added in things that are delicious and left out things that are not. Easy peasy.